The polls had consistently shown the four major parties winning about the same number of seats as in June. This made intuitive sense; they represent mutually hostile outlooks (Islamist, leftist, Kurdish, nationalist), making substantial movement between them in under five months highly unlikely. That about one in nine voters switched parties defies reason. 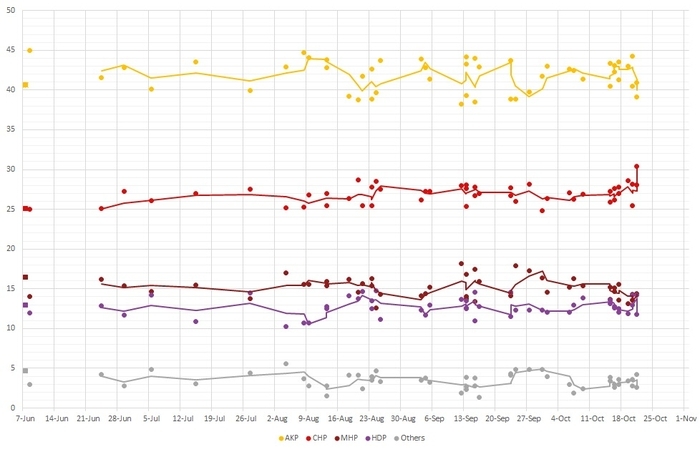 Polling results between the June and November 2015 Turkish elections. Nov. 6, 2015 update: Emre Deliveli asks in the Independent, "Was the Turkish election rigged?" The subtitle reads: "The AKP received 4.5 million extra votes compared to June's election, and people are suspicious." Feb. 15, 2016 update: People may have been suspicious, but Turks dared not say boo. In contrast, three American political scientists (Walter R. Mebane, Jr., Allen Hicken and Ken Kollman) apply their "forensic toolkit" to discern electoral fraud to the two Turkish elections of 2015. Concerning the latter, they find that "Many [electoral] districts have anomalous features. The currently ruling AKP is the party that by most measures benefited from the extensive frauds that we detect, especially in eastern Turkey."